Bible, theology, church matters, and whatever strikes me. Happy Birthday of the Unconquerable Sun! Which, of course, happens to be 25 December, which was the shortest day of the year when Julius Caesar established his new calendar in 45 BC, though it's drifted a little since. The Romans had always worshipped the sun, alng with many other deities, but Aurelian made a new version, the worship of Sol Invictus, an official cult in 274 AD. It was popular with several succeeding emperors, and Constantine I, who legalised Christianity again after the pagan backlash of the Great Persecution, celebrated the god as his 'companion' until long after his supposed conversion to Christianity. 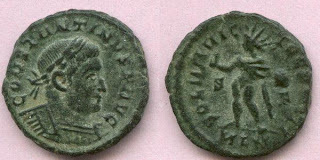 Here he is, on a coin struck in Londinium, with Sol Invictus himself on the reverse. Constantine favoured the church, and declared its tolerance in the Edict of Milan, issued with his co-emperor and rival Licinius in 313, but despite centuries of claims to the contrary, there's no clear evidence that he ever committed himself to Christianity. He issued two rescripts regarding working on 'the venerable day of the Sun', when he wanted people to abstain from any work apart from a few specific things like manumitting slaves. ﻿Neither, however, makes any reference to Christianity, which only became the official religion of the Empire in 380, under Theodosius I. So it seems that some were mixing the worship of the Sun with that of the Son. It was an age when the old polytheistic religion of Rome was effectively dead, and people were experimenting with various monotheisms, dedicating themselves to an array of alternative gods. At the same time, there was no hostility beteen the cults, apart from Christianity and Judaism. People were fee to mix and match, and so syncretism within the church shouldn't be seen as surprising. Constantine I may have been such a syncretist, or he may just have found the church politically useful in reuniting the empire after a series of civil wars. As the first sole emperor in almost 40 years, he must have faced an uphill task, and probably needed all the help he could get. It was in this context that the church adopted the midwinter festival as a celebration of Jesus' birth. It was the time when the days were darkest and shortest, the old year died, and the promise of its rebirth in the spring must have been uppermost in peoples' minds as they faced the long, cold winter, and the 'hungry gap' in early spring, before the first of the new season's crops came in to fill their bellies. Famine was never far away in a subsistence economy, and malnutrition and disease must have been regular features of everyday life at this time of year. The further north you went, the longer and darker the winter, and the greater the likelihood of shortages. The midwinter festival seems to have been almost universal, attached to whatever gods were worshipped in a paricular culture. Essentially, it was cultural, rather than a feature of any specific religion, but in an age when religion permeated almost every act, it was inevitable that it would take a religious form. The Greeks celebrated is as Lenaia, a feast dedicated to Dionysios, when a bull, or originally a man, was sacrificed. The Romans had a tamer version, Brumalia, dedicated to Bacchus. Decmber 25th is first mentioned as the date of Jesus' birth in 354. There was a belief that he was concieved on the same date as he died, and conception around April would obviously lead to a birth about December. It fitted the midwinter festival, though Christmas remained fairly low key for some centuries, only slowly gaining in importance. How much was taken over from the pagan festivals of the time isn't known. One thing's certain, though; the religious aspects were rejected, and if anything was absorbed, it was what we nowadays recognise as cultural not religious. There's nothing particularly Christian - or unChristian for that matter - about having a feast in the darkest time of the year. Occasionally, we meet Christians of a rather narrow bent, who claim that we shouldn't observe Christmas or Easter because they're 'really' pagan observances in disguise. It's sheer nonsense. We don't know when Jesus was born, but obviously the even has to have happened. He can't have been resurrected without dying; he can't have died without being born. It's entirely appropriate that we should celebrate all three. Happy Christmas, Holidays, Winterval, or whatever you want to call it!